Kacey Cleary finds herself parentless at the age of 15, leaving only her sister left in her care. Four years later and they've escaped from their aunty and uncle's house to start a new life in Miami. Kacey's learnt to be strong and leave the past behind, but once she moves into her new apartment, her biggest challenge isn't surviving, it's actually living. I debated quite a bit on whether I wanted to write a review for this or not, but in the end I decided I actually had a few things I wanted to say about this. 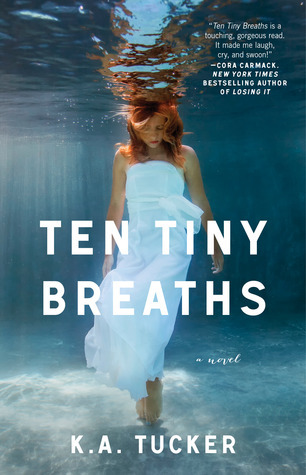 Ten Tiny Breaths was a pleasant surprise, being probably one of the New Adult novels that didn't come off as mild erotica aimed for younger readers. It had a strong plot driven by issues that were actually relatable. K.A Tucker delivered a compelling story of family, trust and forgiveness, that had me engrossed. I was touched by Kacey's backstory and her struggle to come to terms with her grief and guilt. Those raw emotions radiated from her as I was reading, which is impressive for a writer to achieve. There was an underlying aspect of "love" and lust, but it didn't detract from everything that I got out of it. A lot of it had to do with physical attraction but I did feel that the relationship progress was realistic enough. I'm not sure I agree with the plot twist, because if it played out like that in real life then 1) it'd be creepy as and 2) seriously it'd be creepy as. Still, I'll take it for what it is because it seems plausible in that setting and I enjoyed the overall book too much to really deduct points. I didn't catch on until right before the big revealing so I was quite shocked by it. I really did like Kacey for her strong will and independence - the way she took everything into her own hands. My favourite character though, was her neighbour Storm. She was such a bundle of joy and good-naturedness and I completely fell for her charm. I think NA can definitely be a daunting genre to tackle. I'm not particularly fond of it, finding it to be of little substance and not particularly memorable but Ten Tiny Breaths had a lot more depth than what I expected. It's definitely an easy read and I found every moment to be very enjoyable.